Giant sea spider, Colossendeis robusta. Credit: Tim Dwyer, ARCUS. 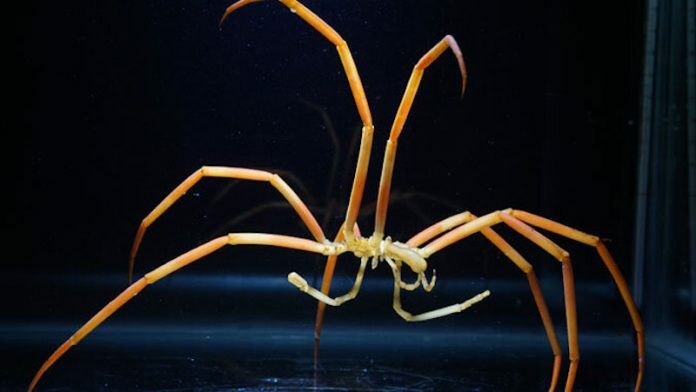 In a new study about giant Antarctic sea spider, researchers have found why marine animals living in the polar oceans and the deep sea can reach giant sizes there. Their findings support the theory ‘Oxygen-temperature hypothesis’, which suggests that animals living in extreme cold can grow to giant sizes because their metabolisms are very slow (i.e. they need much less oxygen). The study was done by researchers from the University of Hawaii and the University of Montana. In the study, the team studied sea spiders, which are marine relatives of land spiders that breathe through their legs. The research was performed at McMurdo Station, Antarctica, and at UH. They aimed to examine if giant spiders were more affected by warming than small ones. The team exercised the spiders to exhaustion by flipping them upside-down and counting the number of times they were able to right themselves at different temperatures, from their normal -1.8°C all the way up to 9°C. They found that giant animals kept up with smaller ones at every temperature. The researchers said they were surprised to see that the giant animals could survive at much higher temperatures and could deal with warm temperatures just like the smaller ones. They then used microscopes to look closely at the big spiders’ legs. They found that the legs of sea spiders are covered with pores. As the sea spiders grow, their exoskeletons become more and more porous. The finding may explain why giant sea spiders seem to get around the laws of physics. The team suggests that thanks to the holey cuticles, the giant spiders may not be as vulnerable to warming oceans as scientists previously thought. Future work will examine the long-term effects of warming on giant animals are not yet understood. The lead author of the study is the University of Hawai’i at Manoa zoology Ph.D. student Caitlin Shishido. The study is published in the journal Proceedings of the Royal Society B: Biological Sciences.